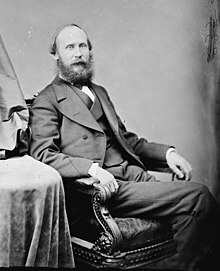 John Rhoderic McPherson (May 9, 1833 – October 8, 1897) was a United States Senator from New Jersey who served three terms of office, from 1877–1895. McPherson attended the local schools and pursued an academic course, and moved to Jersey City in 1859. He was involved in agriculture and was a dealer in livestock. He served on the Board of Aldermen of Jersey City from 1864 to 1870, and served as president of the board for three years. He served in the New Jersey Senate from 1871 to 1873 and was a presidential elector on the Democratic ticket in 1876. He was elected as a Democrat to the United States Senate in 1877 and was reelected in 1883 and 1889, and served from March 4, 1877, to March 3, 1895. In the Senate, he served as chairman of the Committee on Naval Affairs in the Forty-sixth through Fifty-third United States Congresses). McPherson died in Jersey City, New Jersey on October 8, 1897 and was buried in Oak Hill Cemetery in Washington, D.C.
United States Congress. "John R. McPherson (id: M000593)". Biographical Directory of the United States Congress. This page was last edited on 14 December 2018, at 15:57 (UTC).